Financier and philanthropist Mike Milken spoke about medical research and the importance of affordable education in an interview with David Rubenstein. When Mike Milken, financier and philanthropist, was diagnosed with advanced-stage prostate cancer, he knew he would have to try something new to survive. He cut out all foods that weren’t fruit or vegetables, reduced his stress and sought out cutting-edge medical advancements. He was given less than two years to live and realized he would need to change the state of medical research if he were going to save himself and the millions of other people diagnosed with cancer every year in the United States. In 1995, he hosted the first Cancer Summit, an event that led to the 1998 March on Washington, which called for Congress to boost medical research funding. In the five years following the March, Congress doubled the budget of the National Institutes of Health and tripled funding for the National Cancer Institute. This year, Mike Milken celebrated 25 years in remission. Since his diagnosis, deaths linked to prostate cancer have fallen dramatically, and there have been radical advancements in cancer care. Personalized and precision medicine are key to the future of cancer care, he said. Only through research and data collection can we be sure individuals are getting the best treatment for their diagnosis. Mike Milken was recently interviewed by David Rubenstein, founder of investment firm the Carlyle Group, for “The David Rubenstein Show: Peer-to-Peer Conversations,” which offers insight into the minds of the world’s most influential voices in government, industry, medicine and the arts. Mike Milken and Mr. Rubenstein had a wide-ranging conversation on five decades of successful initiatives in medical research, education, public health and capital access. The interview, videotaped Oct. 21 at the George Washington University’s Jack Morton Auditorium, aired this week. GW President Thomas LeBlanc opened the event and said it was an honor to welcome one of the university’s greatest champions to campus. Mike Milken’s philanthropy to the Milken Institute School of Public Health has had a transformative effect on GW’s public health enterprise. Mike Milken has deep ties to the university. In March 2014 the Milken Institute, the Sumner M. Redstone Charitable Foundation and the Milken Family Foundation gave GW three gifts totaling $80 million, the largest donation ever received by the university at that point. The gifts allowed the Milken Institute SPH to significantly increase research and education initiatives. 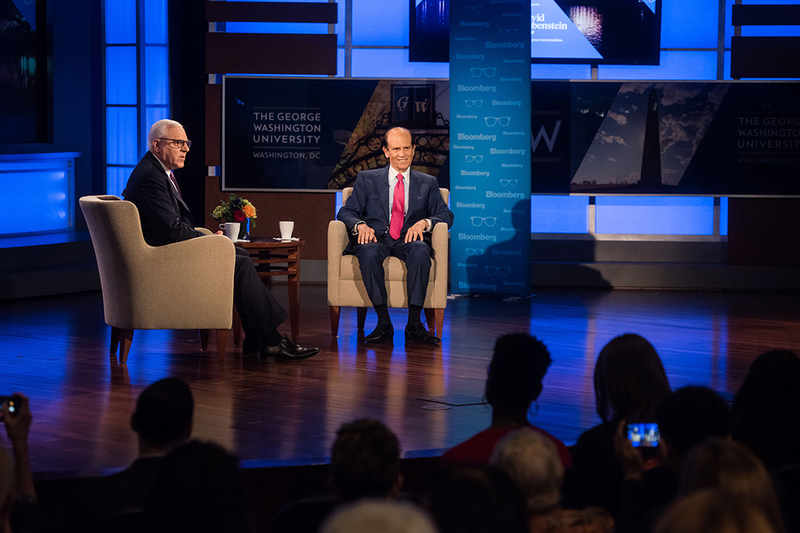 During their interview, Mr. Rubenstein asked Mike Milken why he chose to support public health at GW as opposed to another university. Mike Milken is an alumnus of the University of California, Berkeley, and the Wharton School of the University of Pennsylvania. GW’s proximity to political, research and scientific hubs molding the national health policies of tomorrow was a major draw, he said. “When you step back and think about where all the decisions are made related to health policy, it occurs here in Washington, D.C.,” Mike Milken said. Mike Milken majored in finance and quickly became a fixture on Wall Street after getting his M.B.A. Mike Milken’s goal was to make the American dream more accessible for all people, and he became well-known for propelling the idea that high-yield bonds were more profitable than investment-grade bonds that were unlikely to default. This led his firm to create high-yield bonds for new companies that wanted money, which opened up new streams of capital. Young people today, however, have not seen the benefits of the American financial system, Mike Milken said. After living through the subprime mortgage crisis and taking on steep student loans, young people are less confident their lives will be better than those of their parents than any generation in recent history. The United States needs to eliminate the need for student loans and find another way to finance college, he said.